Many of you have probably heard about hard forks. They were conducted in Bitcoin blockchain, Bitcoin Cash blockchain, and many others. Still, not everybody knows what a hard fork really is. In terms of blockchain technology, a hard fork is a radical change to the protocol that makes previously invalid blocks/transactions valid (or vice-versa). This process requires all nodes or users to upgrade to the latest version of the protocol. A hard fork is a permanent distinction from the previous version of the blockchain protocol, and the nodes running old protocol version will no longer accept transactions/blocks from nodes running new version. This is a more complex definition of a hard fork. Simply put: hard fork can lead to a division of the blockchain when most of nodes do not update to the new protocol version. Often, a hard fork is used to raise the security of the chain. When developers find errors in the older version of a software, it is usually wise to conduct a hard fork. If the network needs to add new functionalities or reverse transactions, a hard fork can be the only way possible. Hard fork splits the path of a blockchain. The process validates those transactions that has been confirmed by nodes upgraded to the newest version of protocol. 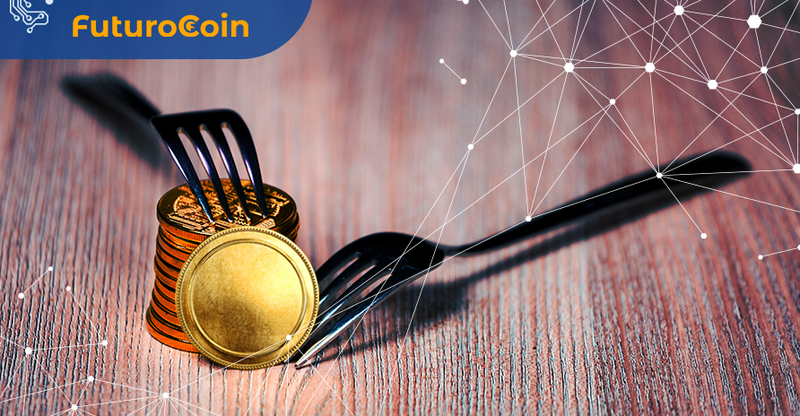 The most famous hard fork was conducted on 1 August 2017. Back then, Bitcoin splitted itself for the first time (before that, there were BTC hard forks, but any one of them led to the division of the blockchain protocol). It resulted in the creation of Bitcoin Cash. Almost three months later, BTC had its another fork. It created Bitcoin Gold. BCH also had one very popular hard fork. It was a starting point for the discussion in the crypto world going for a month or so. In November 2018, the blockchain of Bitcoin Cash was divided. It occurred between two rival fractions called Bitcoin ABC and Bitcoin SV. Of course, there have been many more hard forks. The split of Ethereum and creation of The DAO were among others. A hard fork isn’t that hard to understand. We are here to help. If you want to learn more about cryptocurrencies, you should check out our FuturoCoin Academy. Be sure to check out our medium page, so you don’t miss any future updates about FuturoCoin: https://medium.com/futurocoinfto.